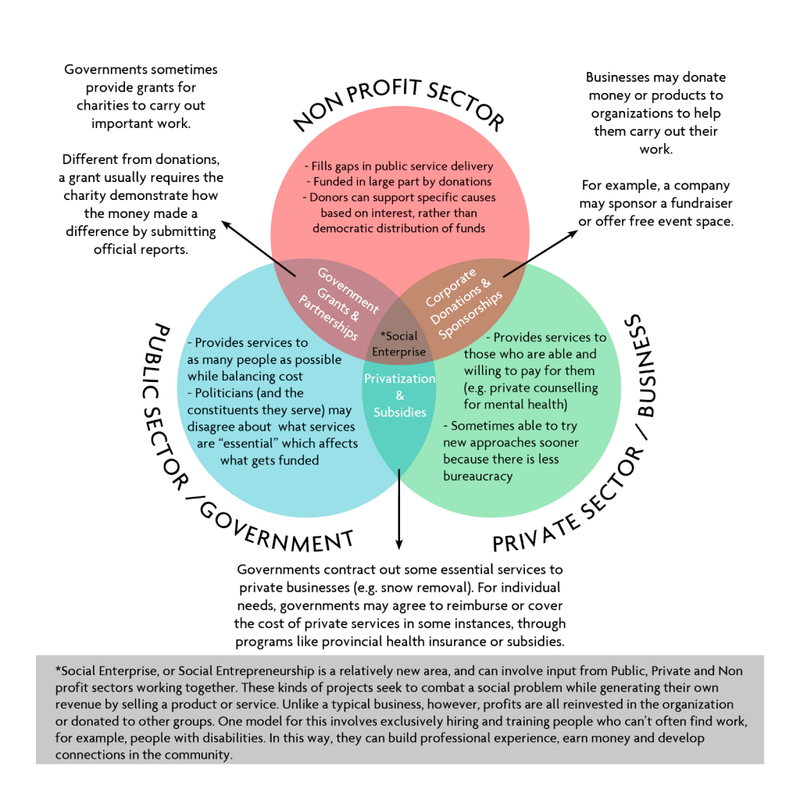 What is the Non-profit Sector? Also sometimes referred to as the third sector, voluntary sector, non-profit, not-for-profit, charitable or social sector, it is a collection of varied organizations with one major thing in common: these organizations exist to make a difference to society rather than generate profits. Lots of different types of organizations fall under this category, including charities, trade unions, social enterprises, public arts organizations, community organizations, independent schools, faith groups, and others that broadly exist for public benefit. The purpose of the non-profit sector is to improve and enrich society; think of its goal as creating social wealth rather than material wealth. The sector exists separately from government; even though both non-profits and governments may work together, or have similar goals, the non-profit organizations and charities carry on their work independent of the legislation and policies of a sitting government. Because they exist for public benefit, these organizations are eligible for a number of tax exemptions. At the same time, they are also carefully monitored and regulated by government agencies, like the Canada Revenue Agency (CRA). All of the money earned by or donated to a non-profit organization must be used in pursuing the organization’s objectives and keeping it running. All charities are non-profits, but not all non-profits are charities. Non-profits that are not charities can exist for a wider range of purposes, like civic improvement, sport, recreation, community engagement, or any other purpose except profit. These groups may include clubs, associations, or societies that you are familiar with, like social, recreational or hobby groups (e.g. curling clubs, golf clubs), amateur sports organizations (sports leagues), or festival organizations (parades or seasonal celebrations). There’s a common misconception that you can tell a “good” charity from a “bad” one by looking at the percentage they spend on administrative costs, or what some refer to as “overhead”. The old wisdom says that the less that a charity spends on these administrative costs, the more they are spending on helping people. One issue with this is that there’s disagreement over what counts as an administrative expense, so this calculation can be inconsistent between organizations. The other issue with it is that administrative expenses usually include things like staff salaries, training, rent and equipment, which varies a lot between different types of charities and the kind of work they do. For example, an after-school tutoring program that relies on volunteer tutors and borrowed space in a school will have dramatically different expenses to a 24-hour youth shelter with trained counsellors and staff. Both can have great impacts! It’s also important that charities be able to invest in the things that help them serve their communities better, like working equipment, outreach materials, and up-to-date training for staff/volunteers. There’s an excellent TEDTalk by Dan Pallota that challenges this myth, and we recommend that you check it out. You may think that if charities and non-profits can’t operate for profit, then no one can earn money working in the sector, but this is a common myth. Paid staff are an essential part of the non-profit sector, and perform a broad range of jobs to support their organizations’ objectives. From administrative staff to managers, and social workers to fundraisers, there are many different roles and many different careers that move the sector forward. Let’s bust some other myths! There aren’t many jobs in the non-profit sector. Within Canada’s 170,000 nonprofits (85,000 of which are charities), 2 million people are employed by the non-profit sector (around 11% of the workforce). 71% are employed full-time. Careers in the non-profit sector are not stable. According to the HR Council of Canada, more than half of all employees in the non-profit sector have been with their current employer for more than five years, and nearly one third have been with them for more than 10 years. It can be challenging for young professionals to get into the sector, due to competition for entry-level roles and an increasing number of contract jobs. This seems to be a common trend across a number of sectors, though, and not isolated to non-profit careers. Working for a non-profit is not really a career path. Working in the nonprofit sector sometimes is considered taking a break from the “real world,” with the implied assumption that it is not an option to spend a lifetime doing this work. In reality, the nonprofit sector provides many people with a lifetime of exciting work. Nonprofits also tend to offer young people more leadership opportunities than other sectors. I’m not really interested in direct service, or social work, so it’s not the path for me. The most visible nonprofits are often soup kitchens, mentoring programs, and other organizations that involve people working directly with other people who need some form of assistance. But many people who work for nonprofits are accountants, computer programmers, sales people, human resources professionals, managers, fundraisers, and executives. Many more are researchers and advocates for certain issues or supporting the work of direct service organizations.